So having now down graded the Ebola light to severe bird flu I decided to do a short walk today say 10km. Pretty revolting exiting Leon scummy industrial and ghetto type scenery. Luckily I was walking in a bit of a daze anyway. Arriving at the 10k town guess what? That's right no accommodation none, zip, nada. Literally they don't provide accommodation at all. Brilliant, now it's a 20k day. 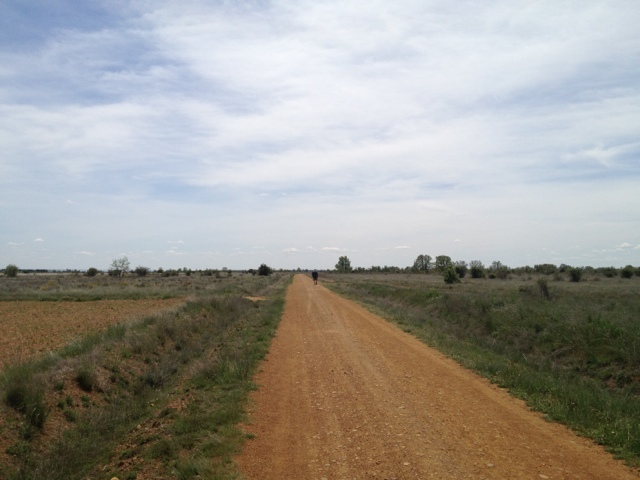 The heat had come up so plodded slowly on through quite dry Meseta landscape (see picture) to Villar de Mazarife. Managed to secure the last scraps of accommodation there and slept for 2hrs before dinner.